What are FMPs and should you invest in them? Vivek Agarwal has the answers. With quantitative easing -- the introduction of new money by central banks into the financial system -- being reversed, yields are rising across the world. This trend is exerting pressure on yields in the Indian debt market as well. In this volatile scenario, one debt mutual fund option that investors can turn to is fixed maturity plans, popularly known as FMPs. These funds have the potential to offer steady and tax-efficient returns to investors even in a rising interest rate scenario. Between 2014 and 2016, there was a rally in Indian bonds and the debt market gave excellent returns. But the market took a breather in 2017. The trend of falling yield for the benchmark 10-year government bond reversed, and it rose 10.95 per cent during the calendar year. With this reversal, the returns of debt funds across the spectrum -- from ultra short term to long term -- were adversely affected. Bond prices have inverse correlation with yields. When bond yields go up, bond prices come down, and vice versa. FMPs are closed-end funds whose maturity can range from three months to five years. The fund manager invests in fixed income instruments like government debt, commercial papers (CPs), money markets, etc that have the same maturity as the scheme. He then holds these instruments until maturity. By holding the instruments in his portfolio till maturity, the fund manager locks in the yield that existed at the start of the fund's tenure. Investors are thus protected from any volatility that the debt market may witness during the scheme's tenure. 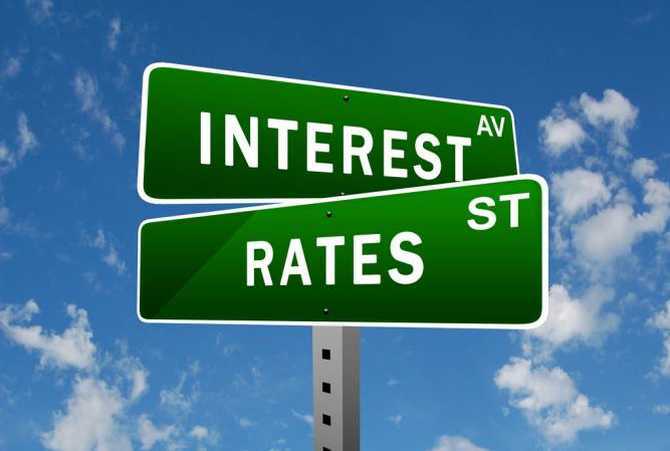 FMPs can be very beneficial in a rising interest-rate scenario, or when markets turn volatile. Even if interest rates rise during the tenure of the fund and returns from bonds turn negative, investors in FMPs are not affected. They will still be able to earn returns equivalent to the yield that existed at the time of investment. FMPs also offer their investors the benefit of indexation. The most popular FMPs are the ones with a maturity period of over three years. Since debt funds offer tax indexation benefits if held for more than three years, investors can generate much better post-tax returns than bank fixed deposits. Investors can claim even four indexation benefits in an FMP with three-plus years of maturity. For example, an FMP purchased in January-March 2018 with maturity after April 2021 would be eligible for four indexation benefits (for financial years 2017-2018, 2018-2019, 2019-2020 and 2020-2021). Indexation benefit is not allowed on interest income from fixed deposits. Tax indexation is a very important concept that fixed-investor investors need to understand. It helps in increasing the purchase price of your debt mutual fund investments to a new inflation-adjusted amount. When you calculate capital gains based on this inflation-adjusted purchase price, the capital gains are reduced by a big margin. This brings down the investor's tax incidence quite dramatically (See table: FMPs are more tax-efficient). In the example, Rs 100,000 is invested in both an FMP and a fixed deposit and earns an 8 per cent return in both. The amount at maturity is Rs 125,971 in both. In the fixed deposit, the tax payable ranges from Rs 2,597 to Rs 7,791, depending on the tax bracket. In case of the FMP, the inflation-adjusted cost of purchase is Rs 119,102. This reduces the taxable amount to Rs 6,870. The tax on this at the rate of 20 per cent is Rs 1,371.9, far lower than in the case of the fixed deposit. And when the benefit of indexation across four years is taken into account, the tax incidence gets reduced to zero. Opt for growth option in an FMP instead of the dividend option. This way, you can avoid the 28.33 per cent dividend distribution tax (DDT). FMPs have a few limitations too. One is that they are not very liquid. Even though there is a provision to list FMPs on the stock exchanges so that investors can trade in them, there is not much liquidity in these securities. Hence, investors should invest only that money which they will not require until maturity. If they try to exit these investments before maturity, they may have difficulty in finding buyers or may have to sell at a significant discount. FMPs are also subject to credit risk. They invest in a variety of fixed-income instruments and thus try to mitigate risk to some degree through diversification. Nonetheless, before investing investors should ascertain the credit quality of the instruments that the fund manager plans to invest in by referring to the Scheme Information Document. 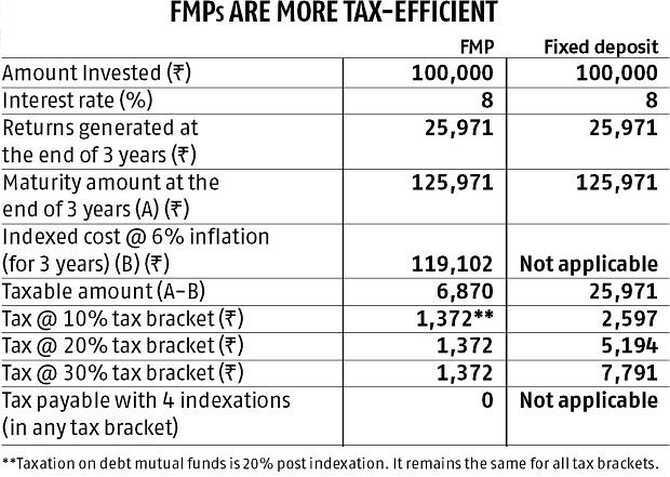 Investors also need to bear in mind that FMPs are not guaranteed-return instruments. They, however, do try to lock-in the current yields. The current yields are only indicative of the returns that could be generated by them. An alternative to FMPs is to bet on open-end debt funds like income funds, credit opportunities and accrual funds if they are looking to get higher returns than bank fixed deposits, but do not want to lock-in their money in FMPs for three years. While income funds can be subject to duration-related risk, credit opportunities funds carry credit risk. Investors who are looking for fixed returns and have a tenure of less than three years (and hence can not avail of the tax indexation benefit) can look at bank fixed deposits.